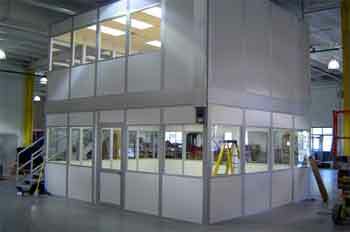 In Plant Modular Offices Prefabricated Installation & Sales Nationwide. If you have a busy manufacturing plant, and want to be able to manage operations efficiently, then there is no better place to be than in the heart of things. The traditional drawbacks of wanting to manage from within the main production area are that it can be difficult to find suitable space within an industrial environment for office areas, and that the processes of manufacture can be noisy and cause problems for office staff. By installing an in plant modular office, you can create a space within a space where you can combine the comfort and convenience of modern office space with a location that allows you full and instant access to the shop floor. In plant Modular offices can be supplied to your exact specifications, and will allow you the ability to create a dedicated office space in the heart of your operations that will provide you with the space in which to work and run your business with easy access to the areas of the business that your decisions will directly affect. Easy Rack have developed a reputation as one of the nations leading distributors of modular office solutions that can be constructed quickly and efficiently within your existing buildings in order to transform the capabilities of your business to organize space effectively. Easy Rack uses only high quality materials in the construction of in plant modular offices, and thanks to the use of pre fabricated panels wherever possible, the building time of the system is minimized, meaning that the disruption to your business operations by the installation of the offices is as small as possible. The nature of the in plant modular office systems provided by Easy Rack means that you can specify the exact space that you need, and then the office can be installed to meet your needs. No matter how many people that you need to accommodate, and the restrictions that are in place due to the amount of space available, the in plant office systems are designed to give you what you need. 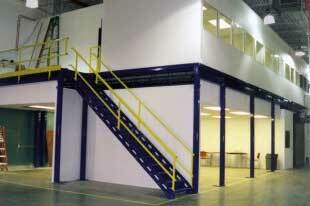 One of the most important aspects of the in plant modular offices offered by Easy Rack is their flexibility. Rather than traditional systems, that are built and then fixed, the prefabricated panels that make up the modular units offered here can be repurposed very quickly to transform the office space for different purposes as and when required. A room can be constructed in one area, and then moved elsewhere very quickly after being disassembled. A number of different variations on the basic in plant modular office systems are available to suit your needs. Standard one story installations offer accessible and easily installed solutions to your needs, while greater use of space can be achieved with a two story installation. When floor space is limited, a tower system that provides office space on an integrated mezzanine floor offers you the best way of adding space without having a negative impact on your production area. Whatever system you choose, you can be sure that it includes all that you need to get the most out of your existing office space without needing to worry about anything apart from the furniture. Break Rooms, CMM Rooms, Computer Rooms, Conference Rooms, Lunchrooms, Cafeterias, Shipping Offices, Receiving Offices, Team Rooms, Two-Story In-Plant Offices, Paint Finishing Rooms, Powder Coating Booths & Machine Enclosures. There are a huge number of benefits of having a modular conference room & prefabricated meeting rooms right in the heart of your factory floor. 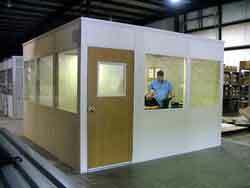 Inplant Modular Offices. By choosing to have a modular inplant office, rather than settling for traditional materials, you also get the major taxation benefit of opting for this system. Prefabricated Offices. The beauty of prefabricated offices is that they can be delivered to your site ready to install and use almost immediately.